FlowFit® is the entry point to Coach Sonnon’s life and sport performance enhancing products available to all fitness and skill levels. In a mere 14 minutes a day transform your body and gain the benefits of “flow”. From beginner to advanced this program is for you. Be Breathed should be a staple in any athlete’s toolbox. In this program, Coach Sonnon presents some of the methods used by the thousands of RMAX athletes in order to enhance their performance thorough the integration of movement, structure and BREATHING. 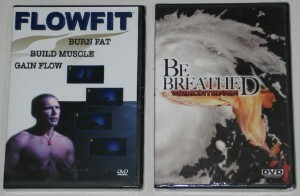 Be Breathed will have immediate and ongoing effect on you training and the exercises and routines within will take your health and performance to the next level. Say good bye to sit ups and crunches…Forever!